4 Pics 1 Word a colorful spinner. A drawing of a man with a black top hat. A metal spinner. A person standing on the top of a bar graph. Thanks for visiting 4-Pics-1-Word.com, here are the cheats for your favorite game. 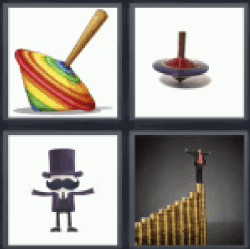 4 Pics 1 Word a colorful spinner.